5. We fell in love. 7. We are still laughing, smiling, and happily in love. After dating for over a year, I decided it was time to propose to Rupa. I asked Rupa and her parents to come to New Orleans to visit my family. On Saturday night, I officially asked Rupa's father for Rupa's hand in marriage. He was very excited. So on Sunday, October 11 it was time to do it. 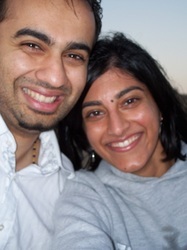 My plan was simple...take Rupa to Lake Town (Lake Pontchartrain) and propose. I told Rupa that we were going to meet a few friends for breakfast and she went along with it. During the 2 minute drive to the lake, Rupa kept asking questions about our breakfast. I made up lies which made her ask more questions. In my head I was thinking "Rupa, be quiet, we're almost at the proposal!" So we got to the lake and started walking. I told her that my friends would be here soon so we just waited and talked. We were talking about random subjects and in my head, I was telling myself "Go...now...do it." So finally after several minutes of random talk, I somehow transitioned into a more romantic conversation...and then I went down on one knee and proposed! Rupa's first reaction was none. She just looked at me as if I fell on the ground. After a few moments she realized I was proposing and gladly said yes. People always ask me if I was nervous, but I really wasn't. I knew Rupa was the one and I knew that this would all work out. Rupa: Caring. Viral cares so much about his family, friends, and community. He gives so much to others and I love that about him. Viral: Honest. Rupa is a genuine person with a beautiful heart. Everything feels right when we're together. 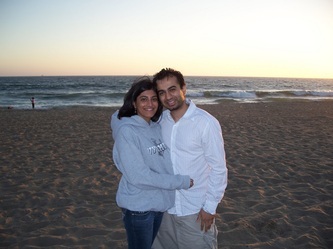 Rupa: I grew up in California with three older sisters - Vandana, Varsha, and Nina. I had a great home life with a patient Dad who dealt with all the women. Viral: I was born in India, but raised in Metairie and Kenner. 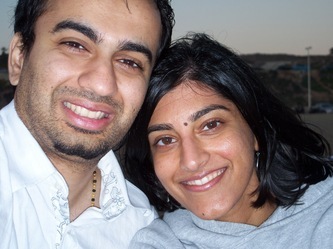 I was often beaten up by my older brother Hiral. Rupa: I attended a 5 year Pharmacy Program at the University of the Pacific in Northern California. Viral: I graduated from The University of Southern California's Film School in 2003. Rupa: I am a loyal Los Angeles Lakers fan. Viral: New Orleans Saints and all USC sports. Rupa: Half Full. I am optimist by nature, and I always try to think positive and hope for the best. Viral: Half Full. I am a happy person who appreciates the good things around him. Rupa: I Love Lucy (I have seen every episode many times) 24, Law and Order. Viral: 24, Good Times, Curb Your Enthusiasm, Reno 911! If you could travel to any place, where would you go? Rupa: I would like to visit Zambia to see where my family lived before I was born. Viral: I would like to see the Bermuda Triangle. Rupa: I like the sales at Express, but I always look for great deals at Ross, Marshall, and TJ Maxx. Viral: My Mom does most of my clothes shopping. Viral: Summer, because I can't deal with cold weather. Rupa: Saver for sure! Viral and I are definitely compatible in that sense. Viral: With enough coupons, I become a spender (I feel like this question was a setup). Rupa: The Shawshank Redemption, Erin Brockovich, Apollo 13, Philadelphia. Viral: Big Fish, Best Years Of Our Lives, The Namesake, Cinema Paradiso. Rupa: Since my Dad is a doctor, I thought I would follow is his footsteps and become one. Viral: I loved (and still love) outer space and always dreamed of being an astronaut. Rupa: Chocolate, chocolate, chocolate! Nothing else compares. Viral: I love butterscotch ice cream. Viral: "A Fine Balance" by Rohinton Mistry.